In recent years I became a Penn State Master Gardener. I also took a Permaculture Design Course to become a Permaculture designer. Permaculture began as a sustainable way to do agriculture, but folks soon realized that its systems-thinking approach could apply to designing all aspects of sustainable human settlements. I discovered many people are interested in gardening and horticulture, but often from an ornamental plant interest. My interest is food growing and infrastructure around things like water harvesting and intensive plant layout. I’m also concerned about the industrial food/pharmaceutical complex. Industrial edible products, that most people call food, are at the root of so many serious medical conditions today. The combination of people being so distanced from: the food system, plant growing, animal husbandry, and cooking from whole foods - is a recipe for ill health and an unawareness of how important sustainable farming practices are to our ongoing survival. I seriously believe that if we don’t re-localize our food system, we will face many food calamities in the future. For example, everyone on the East Coast of the USA eats 300 gallons of California water a week through the food they eat. Their water situation totally affects everyone in the country. 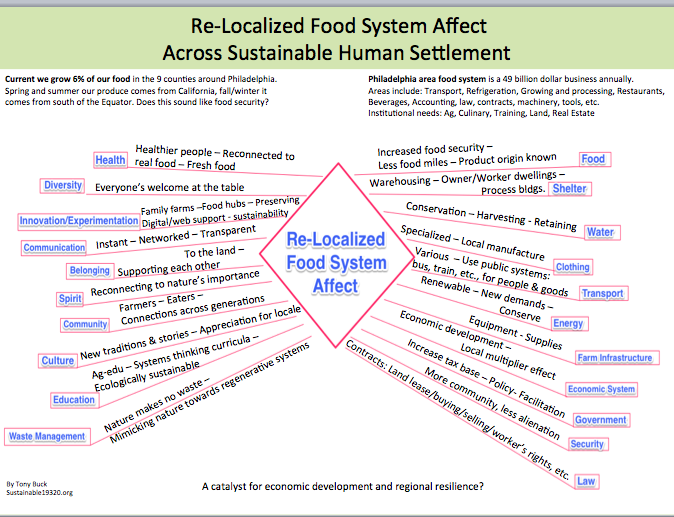 Amazingly, apart from food security issues, by relocalizing the food system, there are so many economic benefits. Every area of the world needs to do this to avoid food shortages while propping up their local economies, which have been gutted by the cheap products distributed from the global south. Take a look at this graphic I made to illustrate the benefits.